Hypno Half-Moon bags are custom designed to carry your Hypno chassis, plus books, clothing, or whatever you need. The bag features a separate, ventilated compartment for your Hypno chassis or ice blades when not in use and another compartment with ample room for your other "stuff". 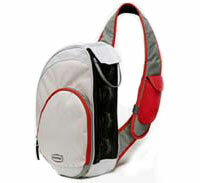 Hypno red, grey and black colors give the half-moon bag a modern look and great style at a reasonable price.